Reports in Salesforce are pretty easy to be created. Anybody who hasn’t had much experience with Salesforce can still go ahead and create a report after an hour’s struggle. However, many advanced Salesforce admins find using the formulas in reports to be a bit intimidating. It’s not that formulas are complicated. It’s just that since people are not used to it, they find it to be scary. Honestly, formulas are way better than making your hands dirty with coding and the value they offer to your reports is simply mind-blowing ! 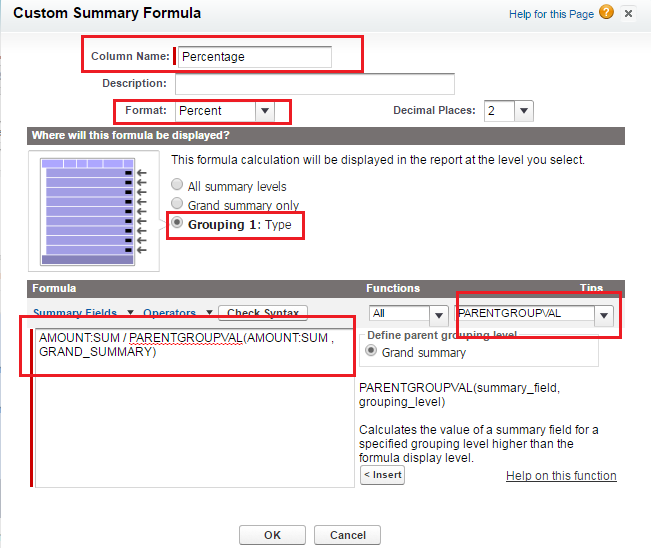 So, in this post I will walk through the PARENTGROUPVAL() function which is one of the most powerful functions to be used in Salesforce report formula. Before I jump into this function, let’s go ahead and create a simple summary report and we will eventually see when will this function come handy. Simply follow the below steps to create a summary report. Create a fresh new report from the standard opportunities Report Type. Now Click on the dropdown beside the Amount field > Summarize this field > Sum > Apply. Click on the Shows dropdown at the top and uncheck Details and Dropzones so that your report looks clean. This report gives you a pretty good picture about the Amount of opportunities associated with each Type. The report also gives you a grand total of the Amount of all the Opportunities. 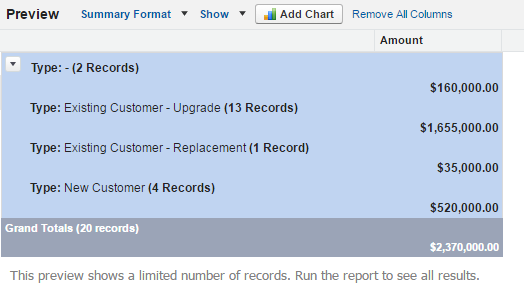 Now, what if you want to identify the percentage of the “Existing Customer – Upgrade” amount out of the Grand total ? This is where PARENTGROUPVAL() function comes into the picture. This function can help you identify the summarized amount of each group and eventually divide it by the grand total. So, below is the syntax for this function. We will now see how do we implement this in our scenario. Now, you will see the percentage share of each Type as seen in the screenshot below. Do you now see how simple the PARENGROUPVAL() function is and the value that it offers ? Feel free to comment on the post if you have any doubts. Happy using Salesforce Reports ! Previous Previous post: Power of Point & Click Series – 2 : Learn how to Set up recurring Time-based workflows in Salesforce! Next Next post: Power of Point & Click Series – 4 : Auto-associate a new Lead with an existing Contact using flows ! Thank you for your post! I am trying to complete a report similar to the example you provided. I want to get a % of growth of won opps of the accounts between the current year vs previous year. I am wondering if the PARENGROUPVAL() would also work on this scenario. Any hints? You really explained this function well and your example is easy to follow and understand. I will check more of your posts to learn.